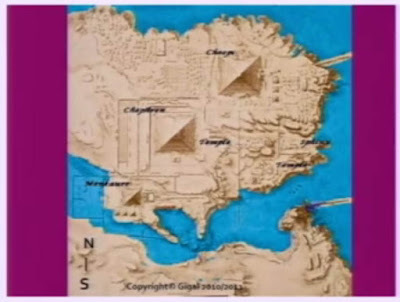 French/Egyptian scholar Antoine Gigal reads Ancient Egyptian and other ancient languages.... she's also found Whale and Dolphin skeletons around the Giza Pyramid Plateau/Complex. Gigal's contention is that the Entire Giza Plateau was flooded by the Nile River, for three months every year, and should be called The Divine Island of Giza. Remember, of course, that (in this time - 5,000 to 1,000 BC - depending on construction time) water has always been of great importance to Megalithic and Neolithic People, where flooding might have periodically filled British/European circular ditches. Especially prevalent to the Giza pyramids because the appear to have been 'managing' water within the complex to 'fuel' some resonant capacity of the Giza Pyramids, according to other research. AFTERNOON UPDATE: okay, I'm now such a gaping fanboy of Gigal's work, I'm going to post her following-day presentation on the subject of theThe Pyramid Complex of Mauritius. She (among other researchers) is finding such Pyramidic structures from our ancient past ALL OVER THE F***ING WORLD.